…live from the Brussels airport, and there is nary a sprout to be seen. Our flight to Kenya (and then on to Uganda) is more or less on schedule–we’ll be departing in a couple of hours. And I have an appointment with a very strong sleeping pill. Our team is fantastic, the flying anxiety is minimal, and God is very, very good. Did you wave as you flew over my house? I added the code as well. I’ll be praying for your team while you’re gone! And look forward to hearing updates. Happy flying! Glad to hear your travels are going well so far. I hope your other flights are comfortable too! I will add the code also. God bless! Code added to my site, and it is so great to hear an update! nice sprouts comment. Ok, sleep good. Can’t wait to hear more! You are a traveling lioness. I have no idea why I felt such a strong need to call you that. But there you go! Prayed for you already this morning. My heart is full just thinking about God’s plan for this trip. I’m so glad you checked in with us! I’ve been thinking about you. Keep us posted. It is so exciting to be able to read posts along the way from you and Shaun and Sophie, Chicago, then Brussels, and maybe Kenya (though wireless at the airport there, maybe not so sure?). God can even work through technology! You’ve awakened my wanderlust, enjoy your journey. The update posts are grand! How could I not add it? We are praying for the entire team here…can’t wait to read the updates! Thought about you all day yesterday. Good to hear from you. We’re praying. Just read BooMama’s blog and my first thought was “sprouts.” How funny is that? Thanks for the code. So excited for y’all!! Have a good flight, Shannon – we’re here in Europe cheering you on! But what about waffles? Did you at least see any of those? I just put the link in my sidebar, and I’ll be putting a post up explaining it soon. So glad to be a part of your journey, in spirit! 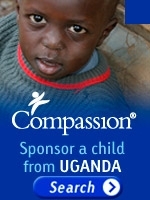 will definitely put that COMPASSION UGANDA button on my sidebar. Glad to hear how the Lord is answering our prayers in big ways as well as small ways – like in “a row of your own” – wonderful! I added a link to your blog and the button on my blog. We’re still praying for you! Okay, obviously I’m missing Belgium. So. I hope you were nourished before heading out to your primary destination. You will be such a blessing. I hope you can capture the sights, sounds, tastes, smells and stories for us. It’s tough to live vicariously, but they have chosen some outstanding writers to do the work. Because we’ll certainly *read* it! Got the code and wanted to tell you that you, specifically, have been coming to mind a lot the past two days and I’ve prayed accordingly for you, your trip, and your family. This doesn’t happen that often, so I’m heeding it. Godspeed. I hate brussel sprouts, but I added the code anyway. Had to chuckle at the sprouts comment. Took me a moment to figure out why you were talking about bean sprouts. Oooohhhh, cause you’re not, you’re talking Brussel sprouts. Hope you catch some sleep. Glad the flying is going well. Anyway- added the code and keeping you all in my prayers! Shannon, what a wonderful thing you are doing with Compassion. I added the code to my blog and will be praying for you and the Compassion team. Hi Shannon – I found your blog through Carla Stewart’s, and what you are doing interested me so much that I’ve posted about it on my blog. I hope your trip goes well and will keep you in my prayers. Drinking lots helps with the jet lag too. Blessings! Once again, I am so excited for you and this fabulous opportunity!!! Trusting you all find a bit of good rest in the very near future!! Adding the code and continuing in prayer!! This is awesome! God Bless! We’re praying. Oh Shannon, You are in my prayers. Thanks for the blog code. I’ve put it on my sidebar. Thanks so much. Going right now to plant the code, will keep it there until you get back! Have a great trip. I am praying for you. This code will be a reminder everyday! Oh, yay! I’m so excited for this journey…and of course I was thrilled to add the banner! Compassion is a great organization. :)Godspeed! Hope the rest of your flight goes well. We can’t wait to get more updates!!! God bless you and your entire team Shannon! THe link is on my blog. I hope you have a safe rest of the flight! I can’t wait to check back and see how things are going. My prayers are with all of you!! What I wouldn’t give to be with you right now! Code has been added. Praying for you and your group!! So excited to read more updates! Button is on my blog!!! God is faithful – even in flying! Can’t wait to hear from you as you learn/see/have so much more to share! The “code” is in place! You’re all surrounded in prayer! I’m going to add the code when I get home and my daughter can help!! Just joking, sorta! I can’t wait to read about your trip I followed a link from BooMama and had never been to your site before. Saw your pic on Boomama. You are so skinny! You need to post pictures of yourself more often! Also, got you in my prayers. I’m praying that you are able to get some good, quality sleep on your trip. I’ve read of your battles with sleep. And oh dear, can an international flight mess with you! I was so sick after a 3 week trip to Europe. I pray you are good as gold during and after your trip. Opps…PolLy! It’s Monday, I can’t even type my own name! Is it possible for a small group to “adopt” a village? Say, in our small homeschooling group, no one could afford to sponsor a child. Could we send books, toiletries, etc. to a specific village as a group? I added it. It’s the least I can do. Have a safe and productive trip. praying for ya’ll, spreading the word, and added the code! Added the code to my blog and Shaun had a bigger one for FaceBook too! How wonderful this is – I’m a Texas gal so you are almost a neighbor (in a truly Western way). I added the code. You are all in my thoughts and prayers. Thanks for the code – added! Can’t wait to hear more! I will pray for all of you! I’m adding the code too. What you’re doing is fantastic. We’re all praying for you and your team. I added the code when you posted this but just blogged about it today. Thank you for being a witness in this special way.